We commend your impressive display of determination to promote the Catholic Church’s social doctrine, as was expressed in the Lenten encyclical “Centesimus Annus”, of the late Pope John Paul II; for, what is, indeed, truly Christian is essentially social. Faith is not limited only to the “soul”, without any interest for the social dimension, but rather, it also plays a pivotal role at the level of society. Our Churches preserve high spiritual values and rich philanthropic traditions. The Church of Rome has a systematic social teaching, which contains solutions to difficult issues in the spirit of the principles of the respect of the person, solidarity, subsidiarity and the common good. On the grounds of these principles, various models were developed and continue to be developed, in order to face social challenges and protect human dignity. 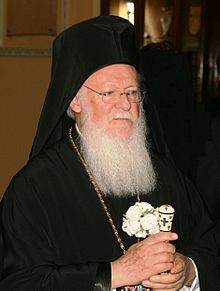 Back in 2015, “The Ecumenical Patriarch … called for urgent action for climate justice ahead of the UN summit on climate change in Paris in December” (https://www.churchofengland.org/media-centre/news/2015/11/ecumenical-patriarch-calls-for-urgent-action-on-the-environment.aspx). So, he is not new to this. This is one way he seems to increase his international prestige. The climate and social agenda that he has been pushing is basically the same one that is in Pope Francis’ encyclical Laudato Si as well as the same one adopted by the United Nations a couple of years ago called the New Universal Agenda, also called (by me) the New Catholic Agenda (as catholic means universal). The Vatican’s Pope Francis was the keynote speaker at the UN the day that the New Universal Agenda was adopted. This, then, got adopted as the Paris Accords. While this was pushed by then US President Barack Obama, current US President Donald Trump has opposed it and stated that the USA could not support it as written (see Donald Trump announces withdraw from Paris accords: A slap in the face to Pope Francis and the Europeans?). The ecumenical and inter-faith movements are moving ahead, yet they WILL NOT RESULT IN A CLEAN CLIMATE OR REAL AND LASTING PEACE. Yet, many Protestants are also falling for it (see Beware: Protestants Going Towards Ecumenical Destruction!). The Bible shows that irrespective of whatever international agreements there may be, they will NOT save the environment–the Bible shows that it will take the return of Jesus and the establishment of the millennial Kingdom of God to do that (Matthew 24:21-22; Revelation 11:18; see also The Bible, Christians, and the Environment). The Bible also clearly shows that the ecumenical/inter-faith movement will also end in destruction (Revelation 18 & 19). This is not something that Catholics or the Eastern Orthodox or the Protestants should want (see also Why Should American Catholics Fear Unity with the Orthodox? and Beware: Protestants Going Towards Ecumenical Destruction! )–yet many of their leaders are promoting this. This is a false gospel! The ecumenical and United Nations’ agendas will not bring peace (see also World Council of Churches Peace Plan). Instead it is laying the foundation for the final ‘Babylon’ of Revelation 17 & 18. The ecumenical and inter-faith movements that the Vatican, certain Protestants, and certain Eastern Orthodox leaders are promoting are clearly condemned by the Bible and should not be encouraged. Notice that Jesus will have to destroy a world of armies unified against Him. Then He and the saints will reign. That is when there will be proper unity of the faith. Even the NJB, a Roman Catholic translation of the Bible, concurs. The nations will be united AGAINST Jesus. Catholics, Orthodox, Protestants, and others need to be concerned about the type of unity that is actually being promoted and what the climate and social agenda really is about. Beware: Protestants Going Towards Ecumenical Destruction! What is going on in the Protestant world? Are Protestants turning back to their ‘mother church’ in Rome? Does the Bible warn about this? What are Catholic plans and prophecies related to this? Is Protestantism doomed? watch the video Charismatic Kenneth Copeland and Anglican Tony Palmer: Protestants Beware! This entry was posted on Sunday, May 27th, 2018 at 8:40 pm	and is filed under Religious News.